Today one of my friends, P– came into 5th period English waving around a nearly-blank white piece of paper. He was trying to contain himself, but not all that well. Something was clearly up. He tried to look modest as he passed me the print out. The University of Chicago! I’m impressed, but I can’t say I’m surprised. He is not only an excellent student and a talented athlete but an all around great person. What’s even more amazing is he’s now four for four – he’s been accepted to the University of Washington, NYU, and Georgetown. All he has left to hear from are the Ivy Leagues – Harvard, Yale, and Columbia. I am so proud of him. And that is why I chose to bake, to celebrate. Well, not really. I don’t know about you but these days I’m finding that I jump at any excuse to cross a recipe off my humongous, out of control “must try” list. Someone’s birthday is coming up? I’m just as excited as they are. P– said it was hardly a special occasion, but no one turns down free cake. I knew exactly what I wanted to make, too, after seeing Bakerella’s scandelously gorgeous Chocolate Matcha Bundt Cake. The chocolate against the green was stunning. It was kind of a no brainer. Matcha is something I’ve tried and liked. 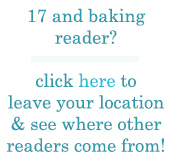 I have dozens of different recipes bookmarked that call for it. Unfortunately, for me matcha is one of those rare, exotic ingredients that I never buy out of price and inconvenience. Like blackberries, which are ridiculously expensive, or cardamom, which I can never use in anything else. But as luck would have it, I made a birthday cake for someone earlier this month and he returned the plate along with an enormous package of matcha powder. The thing is as big as a box of sugar! This was my first recipe using matcha, ever. The cake itself is very good. It’s moist, rich, and dense, and the colors are every bit as beautiful as I’d hoped. I admit that I like the chocolate better than the matcha, but what can I say – I’m a chocolate person by a mile. I might even consider making this recipe again, using only the chocolate mixture. The batter actually made enough for a 10 cup bundt cake plus 6 cupcakes. My one complaint was this: when the chocolate batter is on the outside, it looks extremely appealing. When the green matcha batter is on the outside, it looks porous and somewhat unappetizing. Luckily, I wanted the matcha to be a surprise and put chocolate batter against the pan for the cake. In any case, this recipe is a keeper. I can’t wait to try more with this lovely, fragrant powder. Preheat the oven to 325 degrees. 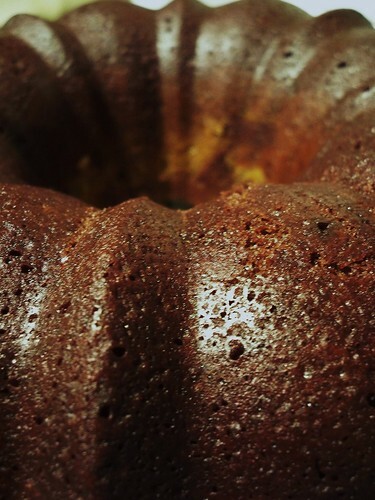 Grease a 10 cup bundt pan and dust with cocoa powder, or flour. There will be batter leftover for cupcakes so prepare 6 muffin tins, or use a 12 cup bundt pan instead. Whisk together all the ingredients for the chocolate batter in a small bowl. In a separate bowl, whisk together all the ingredients for the matcha batter. Cream the butter and sugar with the paddle attachment of a mixer. Add in the eggs, then the milk and vanilla. Mix until thoroughly combined, then separate into two bowls. Mix the chocolate batter ingredients into one bowl of the wet ingredients, and mix the matcha batter ingredients into the other bowl of wet ingredients. Spoon the two batters into the bundt pan, alternating batters until the pan is 3/4 full. 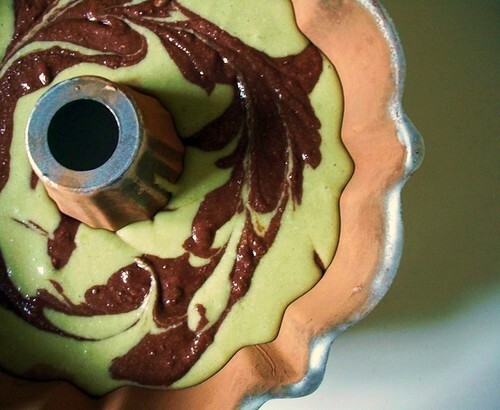 Drag a long, thin knife through the batter to create a marbled effect. Fill the muffin tins with the leftover batter. 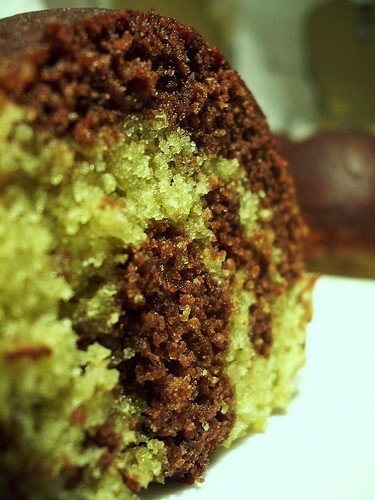 Bake the bundt cake for 1 hour and 15 minutes or until a toothpick comes out clean. The cupcakes take less time to cook, around 50 minutes. Entry filed under: Cake/Cupcakes. Tags: cake, chocolate, matcha. That’s so sweet of you, Elissa. It’s gorgeous. Glad you liked it. And. I’m with you on the all chocolate! I love the picture of the raw bwtter in the bundt. So pretty! a good place to get blackberries cheap, atleast where I live is Sam’s Club or similar bulk store. I got a quart of blackberries, which is 4 of the normal containers for only 2.50. However I live in florida which is where many berries are grown so that could have affected it. But thats where I buy many pricey ingredients more cheaply. Sometimes it is in bulk, and sometimes its not, so don’t be afraid of getting stuck with a lot of an ingredient. Made this for Easter. The flavours of matcha and chocolate are married perfectly. My cake turned out a bit dry though I think I could’ve taken it out earlier since my oven seems to be hotter than most other ovens. Thanks again for the recipe! oxygen levels which can harm marine life. Desalination plants are another means of improving the water supply. increase their efficiency and lower the cost of consumable materials.